The dynamics of online marketing for local businesses is changing – actually for any business, product, or brand. It use to be where you had a website, and you’d spend a lot of time and money building links (think traditional SEO) to get top rankings in Google search. But let me ask you something… has all of that time and money paid off yet? Probably not. Fortunately, the web has evolved into a social nest of people interacting, sharing, and connecting via apps, mobile devices, and also desktop computers. Sites like Facebook and Twitter have redefined the way people use the Internet, and platforms like blogs have redefined the way websites (or webpages) are ranked in search results. Don’t worry, we’re getting the 3 steps to effective use of social media for businesses… but let me just tell you right now, if you aren’t using social media for your business, then you are missing out on the biggest brand building, online exposure, and customer connecting opportunity the Internet has ever scene. What’s the purpose of SEO? I’m talking, old school SEO like link building, link farms, etc…? Wasn’t it to get your website ranked in the top search results of Google? And once (if ever) you did get there, what were you ultimately wanting to accomplish? To connect to people… right? To build your brand to a high quality audience of prospects – those who are searching for what you offer. Social media provides the same end result for any business, product, or brand – it allows you to make connections. But the difference between top search results in Google and social media is scale and long term connections. Now don’t get me wrong, I’m not saying that top search results in Google isn’t a very valuable place to be. But the problem is that by now, the ones who are at the top have already spent the time, and a lot of money, to get there and it will be very difficult for a new comer to come along and bump them out. But with social media, the playing field is level. And now, with Facebook, Twitter, and blogging as your marketing tools, you can now start to build an audience of fans that are looking forward to connecting with you and staying connected with you for the long term – this is called brand building, and it’s something that is much more effective for your business than just getting top rankings in Google for a particular keyword phrase. When you start to leverage social media tools like Facebook and Twitter, you have to ask yourself, what is my overall strategy? There are now 1.5 million businesses on Facebook. A lot of these businesses have simply built a Facebook Fan Page and then have done nothing with it. And the reason is because they haven’t put together a strategy, and they have failed to set goals. Basically, your business needs a vision for what it wants to achieve and become within social media. For example, social media can help your business connect to your local community, and through your Fan Page you can provide valuable resources, news, and information that your local audience benefits from. Or maybe your strategy is to promote sales, have contests, or promote other events that connect to your local audience. Whatever the plan is, the point here is that you need a strategy. If you build a Facebook Fan Page for your business, and you don’t at least have a strategy to get started, then more than likely your Fan Page will just sit without any traffic, and without any influence – just like the majority of Fan Pages do right now. And since the majority of Fan Pages don’t have a strategy, and thus just sit on the web and do nothing, you have a great opportunity to gain the advantage in your marketplace by starting out with a strategy. You’ve probably heard the old adage that content is king. This is so true when it comes to SEO because good content attracts links, and links (when built naturally) equals authority, and authority equals top rankings in Google. But good content is extremely important in the world of social media as well. Think about Facebook and Twitter in relation to good content. What updates on either social network do you share, retweet, or like the most? More than likely it’s the content that is valuable, resources, or helps you / connects with you in some way. So good content is critical in the world of social media. Because good content means people will share your information, and sharing in social media means viral exposure and brand exposure for your business. If 100 people share your recent update, and each of those 100 people have 100 connections throughout Twitter and Facebook, then you just got free advertising (in essence) to 10,000 people. Of course, that doesn’t mean that 10,000 are going to be calling your phone by the end of the day, but it’s free exposure nonetheless. And overtime, these numbers begin working in your favor, especially from a brand building strategy. Finally, no matter what you are doing on the web you have to measure the results. With Facebook Fan Page, you can use your Insights to find out how many new fans you are gaining, percentage wise, each week. And also how many people are sharing or engaging with your content. This tells you if what you are doing is working, and what to capitalize on, and what to eject, as far as strategies go. Twitter can be a bit more challenging to measure results with because there isn’t any embedded analytics for Twitter profiles. But you can use things like Google Analytics on your blog, for example, to see how much traffic visits your blog from Twitter. And this leads me to a point on my overall opinion on the value of social media. 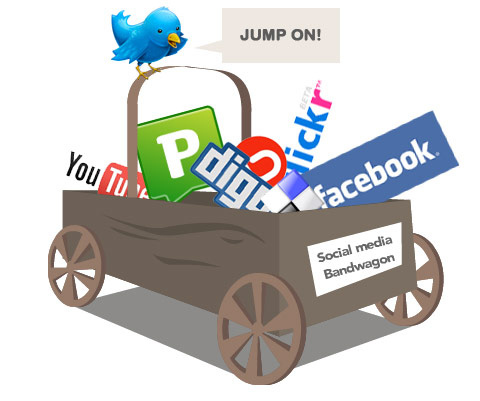 I view social media (Twitter and Facebook primarily) as tools to ultimately drive traffic back to your company website. But social media, in my opinion, is most valuable when leveraged to make connections that ultimately drives traffic back to your business. And from this perspective, your website or blog can definitely have something like Google Analytics, or GetClicky, running and tracking every visitors, referral resource, keyword phrases, and more… all of which tells you what is working best at driving traffic and exposure for your business website – basically, it tells you what to focus on because it’s working, and what to eject because it’s not working.